Regional Speakers to share their knowledge of fly fishing tactics. Beginner Fly Fishing Classes and Instruction for every level: Learn the basics of fly fishing. Fly Casting instruction: From learning how to cast a fly rod to improve upon your skill level, certified casting instructors will be available to talk with you and show you how free of charge. Gear Demos: Dozens of fly rods and fly lines will be available for you to try out on the indoor casting pond at any time. Learn fly fishing techniques to target Smallmouth bass, Carp, Musky, Stripers and saltwater species. Meet Fly shops from around the region: Every fly shop has a niche and this expo gives you the opportunity to meet all of them under one roof. Gear Manufactures: Reps will be showing the latest innovations in fly fishing gear. Find special deals on everything fly fishing! 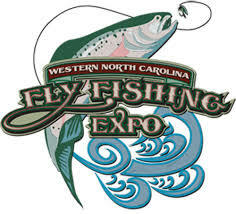 Meet the areas fly fishing organizations: Casting Carolinas, Project Healing Waters, Trout Unlimited and many more! Western North Carolina has one of the most diverse fly fishing communities in the country due to its abundance of angling opportunities. From trout to bass in rivers and lakes, there’s something for every style of fly fishing.